There were conflicts and murders – most of them were committed by communist guerrillas, leftists, and criminals at large. There were lots of dashed hopes, and a lot of wistful staring out over the horizon where the richer and more peaceful cities stood. But the chaotic state of the city experienced a mighty turnaround when a 42-year old iron-fisted man took over. His jugaad approach as mayor ushered an era of social stability to the city. This man is known as The Punisher, the Local Dirty Harry, and The Enforcer due to his tough anti-crime approach. He drives a taxi by night to earn extra money because, according to him, the salary of a mayor is not enough to make ends meet. When asked by the media if this is true he said, “Ang totoo, gusto ko makita ang (totoong) mukha ng Davao City. Nagmamaneho ako ng taxi tapos hihinto ako sa mga kanto, pero kung mang-holdap ka, malas mo lang.” (The truth is, I want to see the real status Davao City. I drive a taxi then I would stop by a corner, but if you are going to commit a robbery, then you are messing with the wrong person). He is no other than Rodrigo Duterte, the mayor of Davao City – one of the safest cities in Asia. He is now 70 but possesses the same aggressive and feisty attitude that made him a successful leader. However, compared to his early to middle years as a public servant, he has now catapulted into national consciousness. His antics as the mayor of Davao city made waves on social media, with people calling him a rare breed of politician in the hurly burly world of politics in a developing country. Because his incessant popularity is showing no signs of abating, netizens urged him to seek the presidency this 2016. On November 21, after a tremendous clamor and pressure for him to run, Duterte said that he is finally going to jump into the 2016 presidential race. The news broke the internet and set the social media on fire; #Duterte2016 immediately became a top trending topic on Twitter – it seems like majority of Filipino netizens have already been infected by the Duterte fever. 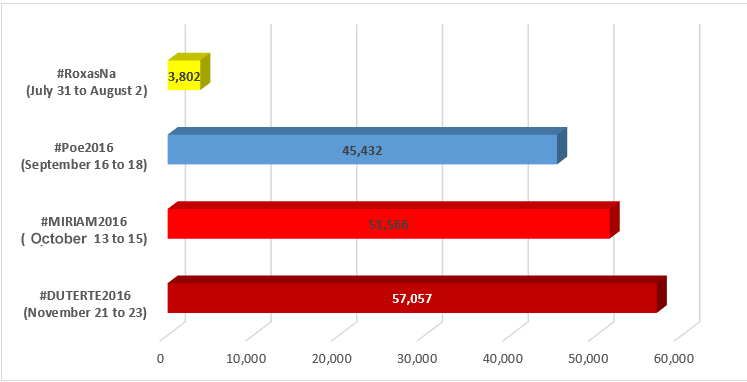 TO THE NEW created a side-by-side comparison on how all the mainstream presidential candidates performed on social media during their presidential bid announcement. 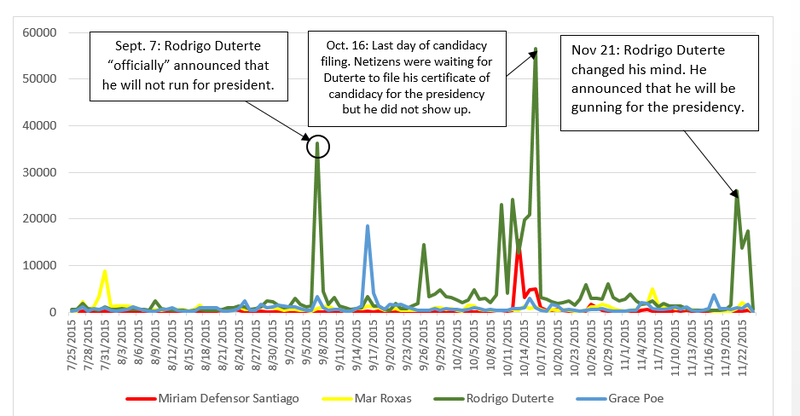 Using Sysomos, a social media monitoring tool, we were able to garner how many times the names of the presidential candidates and their official hashtags were used on the internet on the day they announced (note: Sysomos does not track Facebook mentions. Also, we did not include Vice President Jejomar Binay in the data since his presidential ambition in 2010). Duterte leads the pack with 57,057 #Duterte2016 mentions, followed closely by Defensor-Santiago with 51,566 #Miriam2016 mentions. Meanwhile, presidential survey leader Poe got 45,432 mentions with #Poe2016 while Roxas lagged way behind with 3,802 #RoxasNa mentions. Meanwhile, as of November 23, Rodrigo Duterte’s official Facebook Page had 1.2 million likes. Although his page is lagging behind compared to most of his competitors, his numbers are impressive for he only posted six times since August 31. His page’s average weekly growth in likes is also not something to shrug off – an average 1.2% per week despite the lack of activity on his page is remarkable. 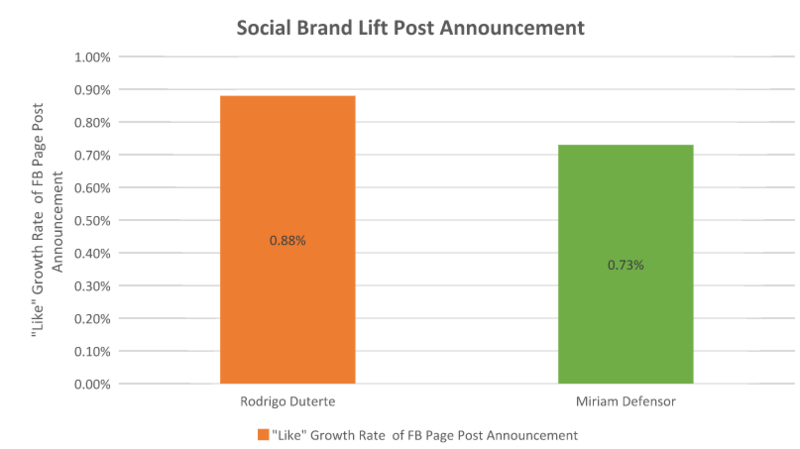 Through the use of Fanpage Karma, we have also tracked the growth in page likes of Rodrigo Duterte and another candidate who has been dubbed as the “Queen of Social Media,” Sen. Miriam Defensor Santiago (disclaimer: we only tracked two candidates because Fanpage Karma can only backtrack two months from today). Miriam Defensor Santiago’s official page had a total of 3,138,596 likes on October 12, a day before she declared her bid for the presidency. Three days after her surprise announcement, her page reached 3,161,737 likes or an increase of .73% from October 12 (+23,141). Meanwhile, Rodrigo Duterte’s Facebook page had a total of 1,204,073 likes a day before his announcement (November 20), and by November 23, his page had already accumulated a total of 1,214,709 likes or an increase of .88% from November 20 (+10,636). Do note that Duterte’s last post on his page was November 8 and he has yet to post anything about his confirmed bid for the presidency. 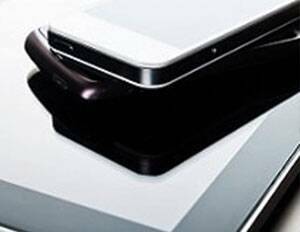 This can indicate that if his page gets revamped and updated more frequently, it would even strengthen his already-ubiquitous online presence. It is not surprising that Duterte continues to capture the hearts of a people living in a poverty-stricken country mired by graft and corruption since he flaunts an image of a hero who knows how to roll in the mud with the “forces of darkness” in the government. Looking at the social media statistics of all the presidential candidates, Duterte seems like a shoo-in to the presidency. However, legal matters still hounds his campaign and the COMELEC still has to decide if they will accept his candidacy. But since Duterte has always been true to his image as the country’s Dirty Harry, he would probably enter a room full of detractors and interpellators and say—perhaps sternly, with a shrewd smile— go ahead, make my day.